Do you suffer from degenerative disc disease, herniated or bulging disc, sciatica, or other spinal problems? Has your physician suggested you consider surgery? You may want to consider spinal decompression therapy first. Spinal decompression therapy has proven effective in treating degenerative discs, facet syndrome, sciatica, herniated discs and spinal stenosis. If you have already had surgery, spinal decompression therapy can still be considered if you suffer from failed back surgery syndrome. Often back pain that is non-responsive to various chiropractic adjustment methods will respond very quickly using Non-Surgical Spinal Decompression. This is one of the special tools we use at Dr. Karl Johnson’s office in Shelby Township, Michigan. Spinal discs do not get oxygen and fresh blood consistently. Decompression and motion can enhance healing by restoring the needed nutrients back into the discs. During therapy, you will go through phases of distraction and relaxation. Once the problem spinal disc is isolated it can be placed under distraction which creates a vacuum effect. The vacuum does two things. First, any portion of the disc that has herniated or protruded will coaxed return to where it should be. Second, the vacuum effect brings in a fresh nutrient supply which can promote healing. 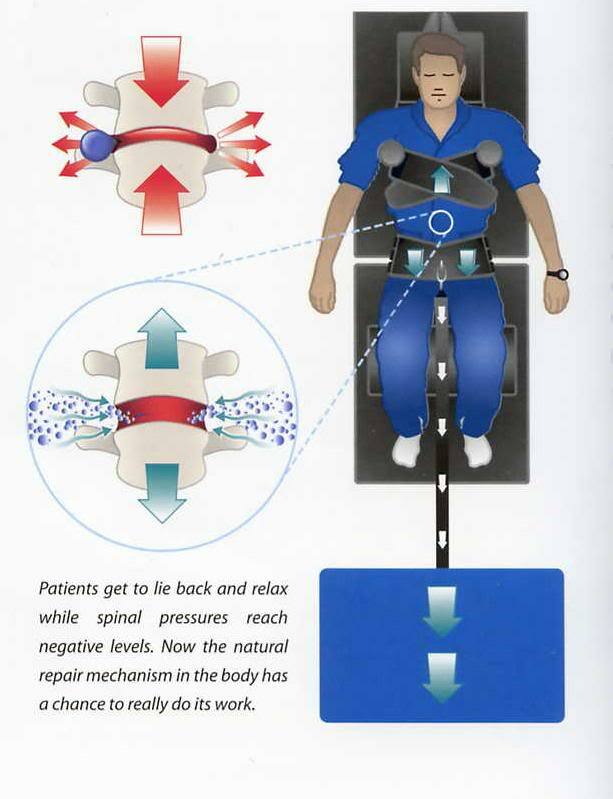 Spinal decompression therapy typically takes from 15-30 minutes to perform. Patients usually have treatment two to four times a week for four to five weeks. Most patients find pain relief within a few sessions. However, to achieve maximum and long-lasting relief, commitment to the entire recommended treatment program is necessary. For those who are candidates and follow the recommended guidelines, spinal decompression has proven to be highly effective. Finally, Pain Relief with DTS Spinal Decompression! “I’ve had lower back pain for many years. I could not sit or stand for too long. Even upon getting out of bed in the morning, I would wake up with severe pain in my lower back. I could not watch TV for too long as I constantly had to get up or move around as the pain would get worse the longer I sat down. And, then the pain would get worse the longer I would stand also. So, either way, the pain kept attacking me and it got to the point where I knew I needed help. I was tired of watching TV with pillows stuffed behind my back. Being an active person, my lower back pain would get in the way of my exercise regimes too. I then decided one day that I wanted to stop this pain. I came to Dr. Johnson in June of 2008 and Dr. Johnson suggested I try this Spinal Decompression Table. So, I did. Within only 3 sessions of using Dr. Johnson’s Spinal Decompression Table, I already felt relief from my lower back pain and the pain started to go away within a week! I was able to stand up longer and to sit for longer periods of time without my lower back pain interfering. I feel like the Spinal Decompression Table has gotten my life back as I am experiencing much more comfort in my life from the pain relief I am experiencing by using the Spinal Decompression Table. I have been to other Chiropractors and I have gotten some lower back pain relief from their adjustments but when I came to Dr. Johnson, he went beyond adjustments. He had the Spinal Decompression Table which provided pain relief like no other. Before you opt for surgery, explore the possibility of spinal decompression therapy. Every person who is interested in spinal decompression therapy will be evaluated to see if he or she would make a good candidate. To schedule an appointment for a Case Review to see if you are a candidate for this breakthrough procedure give us a call at 586-731-8840.